Bio: Anna Welsh, a sixth grader from the philadelphia area, has a passion for sewing, learning and protecting the environment. As a result, she founded little bags. Big Impact, a company that sells handcrafted clutch bags created from resourced vintage materials. Fifteen percent of each sale goes to Tree House Books, an organization dedicated to improving child literacy and education in the North Philadelphia area. At the age of six, Anna began taking handwork classes at The Handwork Studio, where she discovered her talent and love for sewing. She graduated to machine sewing classes at the age of 11. “These eye-openers early on inspired me to incorporate handcrafts and other handmade materials into my everyday life,” she said. Now, little bags. Big Impact allows Anna to continue and share her passion for sewing and helping others. Anna finds the fabric for her little bags at various organizations that collect scraps from warehouse closings and local donations. 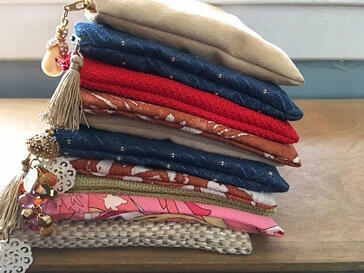 “I have been fortunate to incorporate all of these fabric scraps into my little bags,” she said. Another unique touch Anna incorporates in her clutches is a zipper charm. The charms vary from tassels, to beads, to recycled earrings! Anna said she is always inspired to create new pieces for her collection. She often finds inspiration from her conversations with others. She also finds inspiration from reading magazines, newspapers, and books. Sometimes Anna reads a whole article; other times merely a picture strikes an idea. Other inspirations include businesses, entrepreneurs, Instagram, and giving back to her community. Her passion for education and reading is what inspired her company’s contribution to Tree House Books. 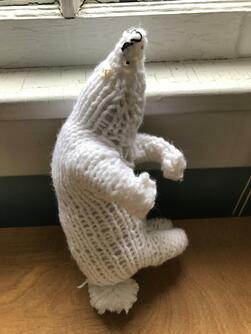 Anna is most proud of the polar bear project she knitted at the age of seven. She uses the bear as a reminded of her perseverance and hardwork. “Yeah—the eyes may be crooked and there are endless holes, but it gives me joy and pleasure just knowing that I created that piece and it is actually holding together,” she said. Anna is also proud of her Young Entrepreneur of the Year award from the Philadelphia Center for Advancing Entrepreneurs and the National Association of Women Business Owners - Philadelphia Chapter, which she received this month (your Handwork Studio family is proud of you too, Anna!). Anna said, she has encountered obstacles when creating pieces. Her solution: talk it out with Miss Meredith at The Handwork Studio. Want your children to learn and be inspired in the same classes that jumpstarted Anna's passion for sewing and fashion? You can find our summer camp programs here. For project ideas join our YouTube Channel or visit our Store.